Listen to the latest entertainment news and celebrity gossip, or get politics, world news and sports audio content that you can personalize. 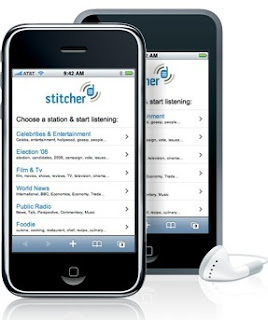 Stitcher Radio is a Web based application, designed specially for the iPhone. * Current headlines from CNN, ESPN, People, Fox News, the Onion and hundreds more. * The juiciest dirt from sources like People and the Daily Dish. * Favorites Station: Listen to the information that interests you, all in one station. * Streams reliably anywhere – no syncing or Wi-Fi needed. * New Content: Hundreds of new shows from the names you trust, updated daily. New version is renewed, check out favorites station: listen to the information that interests you, all in one station. New Content is obvious, here you can find hundreds of new shows from the names you trust, updated daily. Since it is Web based application, Stitcher Radio works nicely on your desktop too. Just click. on the far right arrow. Windows Mobile no need to apply! Point your safari browser to http://www.stitcher.com/iphone/ to try.